Are we? Yes, I just decided that we are. Almost as much reading good books, I love talking about good books–especially with you, my faithful readers of good books and random blogs. (You’re here, aren’t you?) 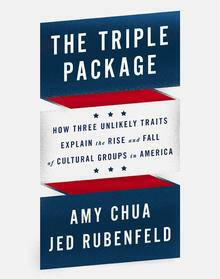 In my last post I offered a free Good Book* to the deserving contestant who guessed its title, and while we wait for a winner**, we need to talk about the Next Big Thing: Triple Package, by Amy Chua and Jed Rubenfeld. You remember the Battle Hymn of the Tiger Mother, of course, and I hope you read her fascinating and funny book. My initial skepticism over Ms. Chua’s “strict parenting” gave way to admiration upon reading her self-deprecating memoir. And because I was skeptical, I took the whole thing with a hefty grain of salt: it was an entertaining read in which she made some valid points, but it certainly didn’t make a Chua-disciple out of me. And though I applaud many of her theories, I lack the drive and discipline to carry them out as she does. The result? I have studious kids who will never make it to Carnegie Hall. I’m okay with that. And I still think that she’s just a fun and substantial writer to read. We need more of those. Yep, its politically incorrect already. Riveting stuff, if you ask me. Picking the brain of a single person is one thing, but understanding an entire culture’s secret to success is something else altogether. Because if the same common denominators work for thousands–even millions–of people, they may just work for us. As was surely intended by it’s authors, the book has already kicked up a firestorm of controversy, especially among academics and journalists who dismiss its claims as racist–though the authors emphasize that culture is what matters, not race. (The debate is raging online; be prepared.) The book examines cultural and familial expectations, not I.Q. points and genetic maps, which is what makes their argument so compelling and, I believe, so optimistic. Everyone has access to the three tenets of the Triple Package–because it’s a mindset, not biology–and therefore, everyone has access to success. The point is that some cultures are embracing these tenents more fully than others, so we can all learn from their example. I should stop here and mention that I belong to one of the cultural groups listed in this book. This may explain some of my interest in it. (Three guesses on which culture I belong to. Spoiler alert: I’m not Nigerian.) But the generalizations about an entire culture’s success are obviously broad, as I know many people from “my” culture who are confirmed underachievers. (No offense, but really. You know who you are.) I wonder: were I not included in any of these esteemed cultural groups, would I feel differently about the premise of the book? Probably. Probably I wouldn’t like it at all, and that’s probably why it’s got so many people hopping mad. But honestly, I am more interested in learning about the tools of success than about who’s using them. Because then I can put them to use in my own family culture, which is where I believe my children’s destinies are truly determined. *hint: the Good Good Book referred to here is not the Bible. Although if I was a better person, that’s what I’d be giving away. Maude’s been a little emotional this week.